Abdul Hamed (front left) greets the landowners involved in the Ta Ann Pelita Silas Plantation JV. BINTULU: The Silas oil palm plantation near here has covered 5,665 hectares since its establishment in 2005. The average palm age profile in the plantation, run by Ta Ann Pelita Silas Plantation Sdn Bhd, is eight years. The Ta Ann Pelita Silas Plantation is a joint-venture (JV) between Ta Ann Holdings Bhd and Pelita Holdings Sdn Bhd, focusing on the establishment of oil palm plantation projects based on Native Customary Rights (NCR) concept at Ulu Sebauh near here. Recently, key officials from Ta Ann Holdings and Pelita Holdings together with project participants from the longhouses hosted a visit by Minister of Utilities Dato Sri Dr Stephen Rundi Utom and his delegates. 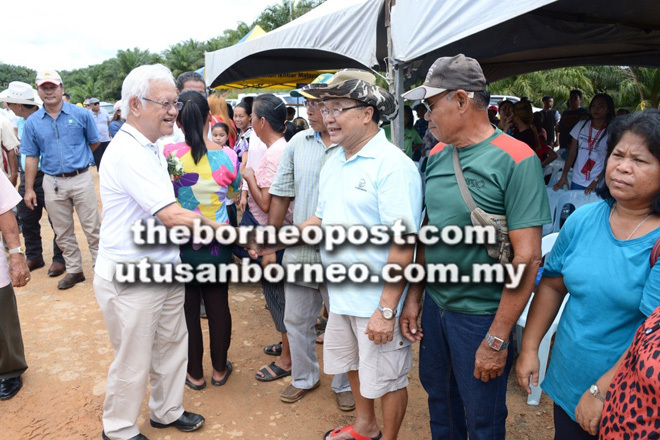 Ta Ann Holdings executive chairman Datuk Amar Abdul Hamed Sepawi and Ta Ann Holdings chief executive officer Dato KH Wong led the tour around the estate, where the VIP visitors got to see for themselves the field operations. In his remarks, Abdul Hamed expressed his appreciation on behalf of Ta Ann Holdings to all stakeholders, especially the landowners, for their trust and cooperation in ensuring smooth progress of the JV. “Ta Ann will remain committed to elevating the welfare and living standard of the local community through timely dividend payments and other corporate social responsibility activities such as extending financial aid to the needy and deserving students, to which Ta Ann has pledged RM1 million,” he said. Meanwhile in his speech, Dr Rundi thanked Ta Ann Holdings for its courage and willingness to take up the challenge to develop the previously-idle land into a productive estate, which had brought about many socio-economic benefits to the landowners. “I’m pleased to see the positive outcome and this JV project is one of the best and most successful of its kind in Sarawak,” said Dr Runid, who is Kemena assemblyman. He further emphasised the importance of the spirit of collaboration and mutual respect in sustaining the success of the project.